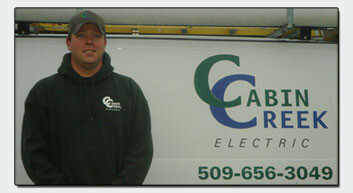 Based in Ellensburg, WA, Cabin Creek Electric is a privately-owned and operated electrical contracting company. Founded in 2004 Cabin Creek Electric continues to provide the same great service and professionalism that they have from the beginning. Owner and Journeyman Electrician Brad Niebuhr has always made providing the best service to his customers the number one priority. Brad has transformed Cabin Creek Electric into a premiere electrical contracting company. The scope of work that we perform includes: commercial, industrial, and service work. Though Cabin Creek Electric is based in Ellensburg, WA, we are able to perform jobs in and out of state depending on the project. Please contact us for help with your next electrical project.